North Sulawesi Scuba Diving -- North Sulawesi offers unparalleled marine biodiversity, with a wide range of dive experience options. But for divers interested in searching out encounters with bizarre and beautiful critters, Lembeh Strait, located near the port town of Bitung, hosts the best muck diving on the planet. And besides the sand, divers can take the plunge on pinnacles, walls and slopes of extravagant hard and soft coral gardens as well as a number of wrecks, some dating from WWII. Diversity is the operative word here. Lembeh Resort -- Lembeh Resort offers comfortable and spacious accommodations for visitors in an idyllic location overlooking Lembeh Strait. 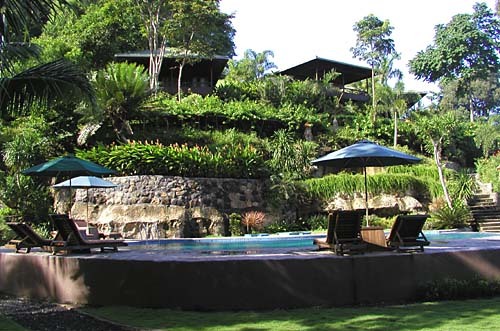 For a truly exceptional experience in a relaxed and professional atmosphere, Lembeh Resort is a superb choice. Diving Lembeh - Lembeh Resort's professional dive team have extensive experience diving in the Strait, and their infectious enthusiasm will result in the best possible dives day after day. The focus is on personal attention, doing their utmost to ensure that guests fulfil their dreams and see most if not all the critters on their wish lists. Unlimited diving is offered to resort guests, with the majority of the 40+ sites within the strait only minutes away by boat. The spacious camera room and equipment washing/drying facilities are only steps from the boat. Special consideration is given to photographers and their delicate equipment. Nitrox is available at optional expense. 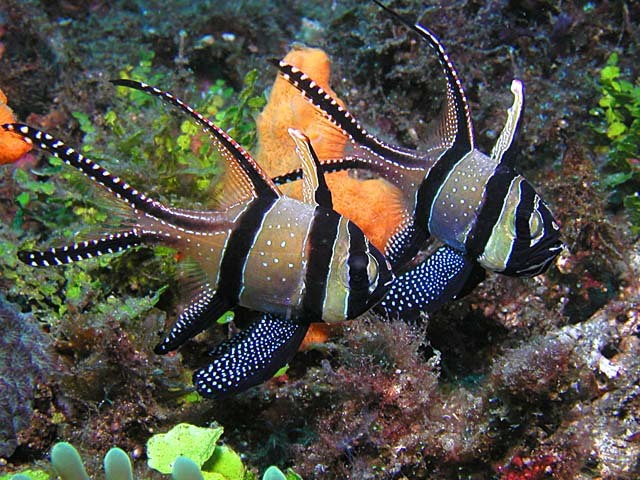 Amazing Marine Life -- Lembeh Strait has already been established as the mecca of what is known as muck or critter diving. Professional photographers and film crews are regular visitors to the strait, shooting award-winning images of the extraordinary inhabitants that mesmerize divers dive after dive. Pygmy seahorses, mimic octopus, flamboyant cuttlefish, mandarinfish, hairy frogfish, ghost pipefish, rhinopias, pegasus seamoths, banggai cardinalfish, stargazers, bobbit worms, harlequin shrimp, candy crabs, bobtail squid, devilfish, snake eels, etc. The list seems endless, with every dive an opportunity to discover a species new to science. The array of nudibranchs and crustaceans is astounding. The number of cephalopod species on display amazing. The assortment of eels and venomous fish species limitless. "Going macro" will open an entire new world to divers who follow the maxim "go slow and look down". Different months offer a variety of highlights, so repeat guests can always look forward to something new and exciting on subsequent visits. Getting to Lembeh Resort - International flights connect from Los Angeles to Singapore or Bali. From there fly Silk Air or Merpati to Manado. 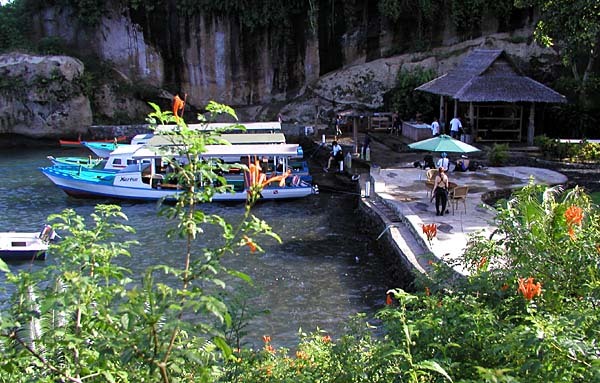 Dive package includes transfer from Manado airport to the resort. Contact Island Dreams for more information. And do it now...both Kungkungan Bay Resort and Lembeh Resort have become so popular, that they both routinely sell out during prime seasons. Jet service between Singapore and Manado operates Monday, Wednesday, Friday, and Saturday on award-winning Singapore Airlines (and its subsidiary Silk Air). You'll enjoy superior jet service (and two checked bags at 66 pounds each) all the way. Package Pricing - Your Lembeh Resort package includes full board in Deluxe Cottage, accommodations, breakfast, lunch, afternoon snack and dinner; unlimited tea, coffee, water; guided day boat dives, air tanks; unlimited self guided house reef; round trip airport transfers and fuel surcharges. Not included - Alcohol and soft drinks, wifi Internet, massage, land excursions, dive center gratuities, and other items of a personal nature. Nitrox fills are available at additional expense.